No one in 1840's New York likes fires, but Copper Star Timothy Wilde least of all. So when an arsonist with an agenda begins threatening Alderman Robert Symmes, a corrupt and powerful leader high in the Tammany Hall ranks, Wilde isn’t thrilled to be involved. His reservations escalate further when his brother Valentine announces that he’ll be running against Symmes in the upcoming election, making both himself and Timothy a host of powerful enemies. Meanwhile, the love of Wilde’s life, Mercy Underhill, unexpectedly shows up on his doorstep and takes under her wing a starving orphan with a tenuous grasp on reality. It soon becomes clear that this wisp of a girl may be the key to stopping those who have been setting fire to buildings across the city—if only they can understand her cryptic descriptions and find out what she knows. Boisterous and suspenseful, The Fatal Flame is filled with beloved Gotham personalities as well as several new stars, culminating in a fiery and shocking conclusion. Distributed in thirteen countries and heralded by The New York Times Book Review as a "rollicking historical novel" and "a sensational account of what early police work was like," The Gods of Gotham introduces Timothy Wilde: a close observer, a heedless romantic, and one of the first and best copper stars on New York City's inaugural police force. The first in a series, this thriller is more than a mystery or detective procedural—it's a stark look at a still-feral Manhattan, rife with crime and religious bigotry, and a character-driven family drama in which decades-old secrets are ultimately revealed. Lauded in a starred review fromPublisher's Weekly for its "vivid period details, fully formed characters, and a blockbuster of a twisty plot," The Gods of Gotham is Faye's attempt to immortalize the origins of the most famous law enforcement organization in the world. It will appeal to fans of dark mystery and period drama, adventure and history alike. Breathlessly delivered and painstakingly researched, Dust and Shadow gives readers a distinctive vintage mystery, pitting Sherlock Holmes against Jack the Ripper in a vividly detailed nineteenth-century London. Ever since Sir Arthur Conan Doyle created the character of the detective Sherlock Holmes, fans have clamored for more. 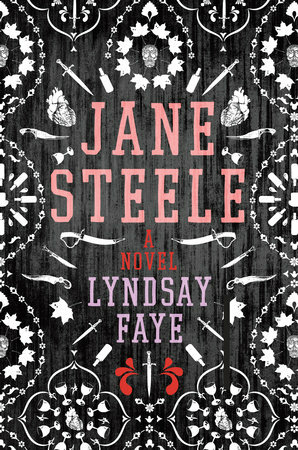 Numerous authors have taken up the task of keeping Holmes alive, but few have successfully delivered as faithful an offshoot as Lyndsay Faye's Dust and Shadow, wherein she brings an unparalleled authenticity to the legendary hero. Just as Faye breathes new life into Sherlock Holmes, she masterfully recreates one of history's most diabolical villains with her version of Whitechapel's serial killer; penned as a pastiche by the loyal and courageous Dr. Watson, and brimming with impeccable historical detail, this astonishing debut novel explores the terrifying prospect of tracking a serial killer without the advantage of modern forensics and profiling.